Caid Du Berlais won the Paddy Power Gold Cup by a head in a thrilling finish at Cheltenham. Johns Spirit, who was bidding for a second successive victory, led at the final fence but was overtaken by the 10-1 shot just before the winning post. 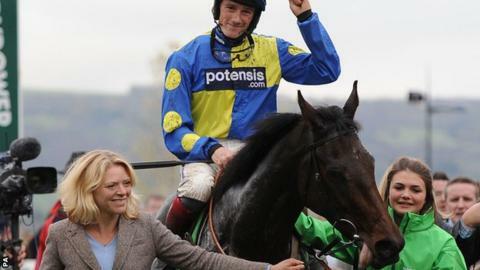 Winning jockey Sam Twiston-Davies said: "I've got a lot of apologising to do as I told (trainer) Paul (Nicholls) not to run him, but he travelled and jumped." Present View, the 5-1 favourite, was third and Oscar Whisky fourth. Johns Spirit looked to have done everything right under Richie McLernon and went clear after jumping the last well but was caught in the final few yards. "He ran a blinder and the weight beat him in the end. It's hard to get nicked on the line, but that's Cheltenham," Johns Spirit trainer Jonjo O'Neill said. Read more on Jonjo O’Neill: Can he join legends Fred Rimell and Fred Winter?